December 21, 2017 By Will Dabbs, M.D. & filed under All Articles, Rifles & Carbines, Weapons. 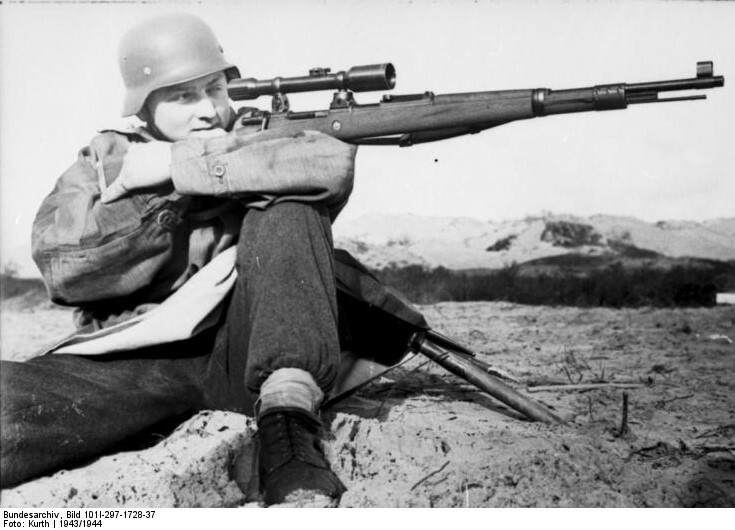 German Fallschirmjager is outfitted as a sniper armed with Walther K43 sniper rifle circa 1944. Exploits of German snipers on the Eastern Front yield fascinating insights into state of the art in military sniping during WWII. On 22 June 1941, the German Wehrmacht launched an offensive into Russia with 139 divisions across an 1,800-mile front. Operation Barbarossa was the largest military offensive in human history. Around three million German troops took part. The German war machine was then justifiably thought to be invincible. Four years later, Adolf Hitler took his own wretched life as a victorious Red Army seized Berlin. During the interim, the Eastern Front claimed tens of millions of lives, both German and Russian. The insatiable appetite for death that characterized this most horrible of places consumed an entire generation. The scars that remained changed both nations forever. One of those millions of German soldiers who fought on the Ostfront was a young mountain trooper named Sepp Allerberger. Sepp was a common man from common beginnings who found he had talents for fieldcraft and riflery. His efforts in the East yield some fascinating insights concerning the science of sniping in World War II. Albrecht Wacker’s book, Sniper on the Eastern Front: The Memoirs of Sepp Allerberger, well documents these exploits for us. By middle of WWII, German snipers were using Kar98k bolt-action rifles with either four- or six-power telescopic sights. In an effort to explore and expand new military technologies, German sci-entists and soldiers travelled to the vast plains of the Soviet Union for joint research projects that orbited around armored vehicles, combat aircraft, and Infantry tactics. One of these many joint projects involved telescopic rifle sights. The Ger-mans brought the science, but the Russians took good notes. As a result, the Red Army was well ahead of the Wehrmacht in the field of precision marksmanship at the onset of Barbarossa. The standard Soviet sniper rifle was an otherwise unremarkable Mosin Na-gant M1891 bolt-action rifle equipped with a relatively crude 4X fixed-power telescopic sight. It was with such a captured rifle that Sepp Allerberger learned his craft as a battlefield marksman. Though the design dated back to World War I, a scope-equipped M91 was a hard-hitting and reliable bat-tlefield tool. To keep his captured sniper rifle fed, Sepp typically used standard 7.62x54mm rimmed ball ammunition taken from dead Russian soldiers. Special sniper-grade ammunition that fired explosive bullets was particularly prized. Sepp saved this unusual and rare ammunition for exceptionally im-portant targets. K43 made broad use of stamped steel and marginally finished castings in its design. Safety was a pivoting lever at rear of receiver. German industry strained to catch up in the field of combat sniper weapons, and soon they were producing their own sniper-grade explosive ammo. Allerberger reported that a single round of this ammunition would sever a five-centimeter tree trunk. The Germans fired these rounds through ac-curized Kar98k rifles that sported a four- or six-power scope mounted via a complicated mount. Originally the Germans issued to their battlefield marksmen sporting optics secured from private German citizens. This stopgap measure offered Ger-man soldiers in action a modest advantage until German industry could produce standardized optics en masse. One of these early efforts was a long-eye-relief 1.5X fixed-power sight called the ZF-41. It mounted forward on a Kar98k at the rear sight. Aller-berger and his mates roundly ridiculed this sight as worthless in action due to its trivial magnification. ZF-4 scope was a fixed-power 4X op-tic designed for short- to medium-range engagements. It was mounted on Kar98k, G/K43, MP44, and FG42 rifles. The standard optical sight the Germans most commonly used was the 4X fixed-power Zielfernrohr ZF-4. 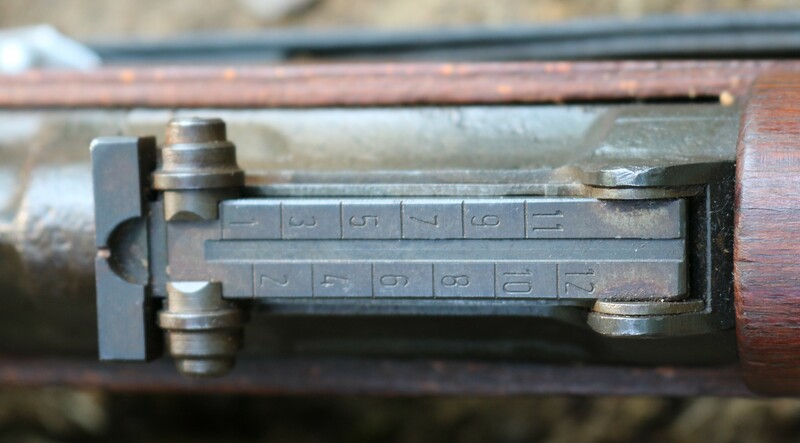 This cool little optic found itself on the Kar98k, MP44, FG42, and G43 self-loading rifles. While its 4X magnification was not particularly helpful at truly long ranges, it was an effective close- to mid-range optic. When mounted atop a self-loading rifle, this sight was indeed a powerful combat multiplier. A Canadian sniper executed the longest confirmed sniper kill in military his-tory in May 2017 using a McMillan Tac-50 sniper rifle. This young man con-nected with a single round at 3,540 meters. While some degree of luck was undoubtedly involved, this shot exhibited a phenomenal degree of profes-sional skill. By contrast, the longest shot recorded in Allerberger’s book was around 600 meters. In that case, Sepp was occupying an elevated vantage and had a clear view of a group of Russian soldiers relaxing on the far bank of a broad riv-er. Using his captured Russian M91, Allerberger estimated his elevation and sighted on a point of aim above the head of his target. His shot caught the hapless Russian center of mass. A great many of Allerberger’s deadly shots were taken at much shorter ranges. Tidy little ZF-4 scope was used on MP44 rifles. Most of Sepp’s combat shooting was at 150 meters or less, and a great many were closer—75 to 80 yards. Sepp’s capacity to master battlefield camouflage and movement was much more critical than his marksmanship skills. 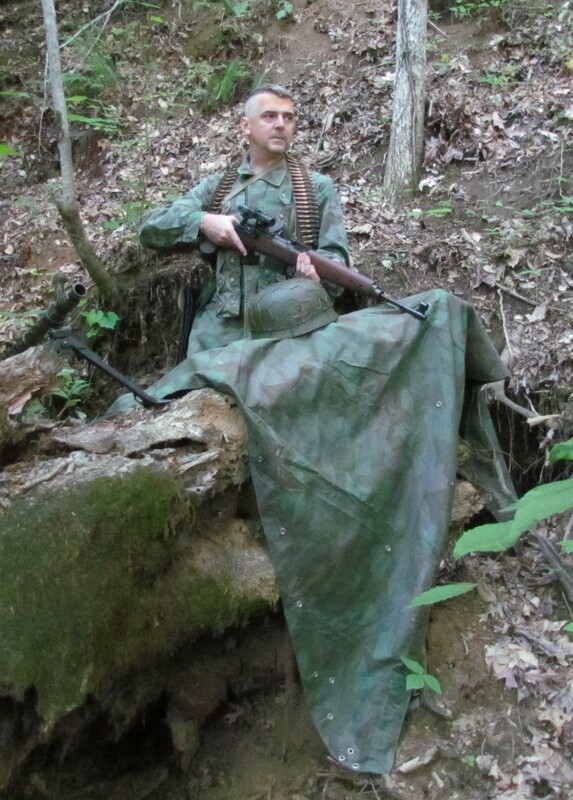 He actually used an old umbrella frame festooned with camouflage material to help conceal his positions without unduly restricting his mobility. Allerberger chose and prepared his positions meticulously, taking into ac-count covered routes into and out of his sniper hides. More than anything else, this is what kept him alive. In one particularly impressive episode, Allerberger single-handedly foiled a sizeable Soviet armored infantry assault by carefully firing captured Russian explosive bullets through the vision slits of American-made M3 halftracks—received as part of the Lend-Lease program—at ranges of less than 100 meters. Sepp’s meticulous marksmanship neutralized the vehicles’ drivers and broke the back of the assault. Walther K43 was Germany’s answer to the M1 Garand. Sporting a reliable action adapted from that of Soviet SVT-40 autoloading rifle, K43 was more properly a Designated Marksman’s arm. The Walther Gewehr 43 was the Nazis’ answer to the superlative American M1 Garand. A gas-operated design actually pirated from the Soviet SVT40 self-loading rifle, the G43 was relatively lightweight and offered fast and reliable semiautomatic fire from a detachable ten-round box magazine. 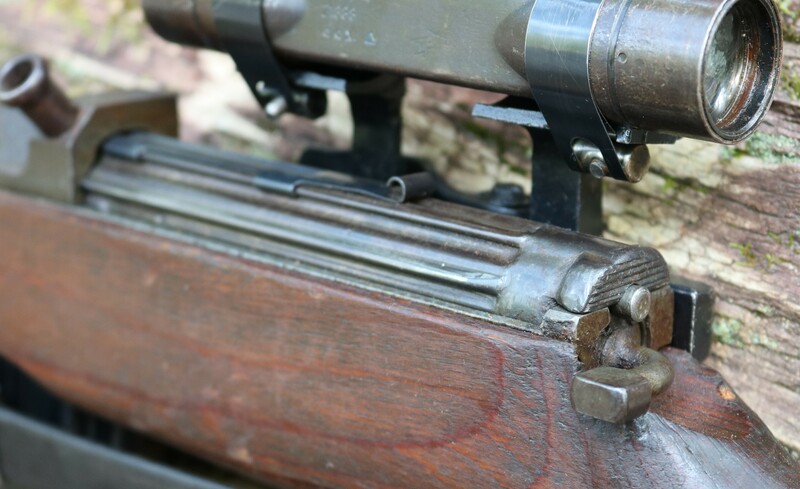 Though the magazine was tidy and removable, German Infantrymen were typically only issued two spares and fed the gun instead via standard five-round stripper clips from the top. These strippers were the same sort that fed the bolt-action Kar98k. Front sight on K43 was hooded. Short length of cleaning rod was combined with those of several other soldiers to create a single serviceable tool. The G43 was later designated the K43, but the two weapons were otherwise identical. The G43 included a short length of cleaning rod underneath the barrel. Several soldiers would pool their cleaning rod segments to make a single usable tool. The rear sight of the G43 was a sliding tangent, while the front sight was a fixed hooded barleycorn. The leather sling mounted on the left side. The safety was a rotating lever at the back of the receiver. A sheet steel re-ceiver cover helped keep the action clean from battlefield crud. G43 rifles were intended to be issued at the rate of 19 rifles per Infantry company, along with ten separate ZF-4 sights and mounts. Allerberger fired all the new rifles his unit received and selected the most accurate for marksmen rifles. The scopes and mounts were then matched to their host rifles and marked by hand with the gun’s serial number. Rear sight on K43 was a sliding tangent optimistically calibrated out to 1,200 meters. Sepp noted that the steel used on these components was very hard and difficult to mark. For this reason, matched rifle/scope pairs are very difficult to find nowadays. My K43 sniper rifle was a high-mileage gun-show find. Showing the obvious stigmata of hard combat, this old WWII gun was missing its scope, front sight hood, and magazine. The scope mount was intact, and the scope mounting straps were found hidden in the cleaning kit compartment in the back of the buttstock. The story behind the gun was fascinating. An American GI fighting in Europe captured the rifle new and brought it back as a war trophy, intending to use it to hunt whitetail deer in Mississippi. Unable to find any quality 7.92x57mm ammunition to feed the gun, he simply gave the fully operational sniper rifle to his son to use as a plaything. The scars and dings the gun subsequently suffered were incurred from mock little boy combat around the neighborhood rather than the real thing on a European battlefield. Along the way, the scope and accessories were lost, and the gun was eventually forgotten in the bottom of a toy box. It was obviously a different time. I scored replacements for the missing optics and parts on Gunbroker and carefully weathered the magazine and front sight hood to match the rifle. The end result is the spitting image of the sniper rifle that Sepp Allerberger wielded on the Eastern Front. It represents an unusual example of a des-perate tool used in desperate times. Sepp Allerberger served as part of his Gebirgsjager (Mountain) division throughout the long slog back across Russia. The German Wehrmacht did not recognize kills undertaken during normal offensive and defensive op-erations. Additionally, confirmed sniper kills had to be verified by either an officer or senior NCO before they could be officially counted. Regardless, by any reasonable measure, Allerberger was a remarkably successful battlefield marksman, so much so that he was awarded the coveted Knight’s Cross near the end of the war. 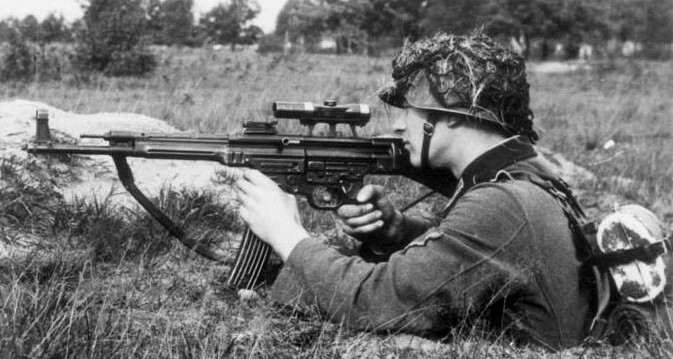 Before his surrender, Allerberger placed his cherished G43 sniper rifle underneath the tracks of a Sturmgeschutz assault gun to prevent its falling into the hands of the Allies. Russians were markedly ahead of other WWII combatants in battlefield sniping. 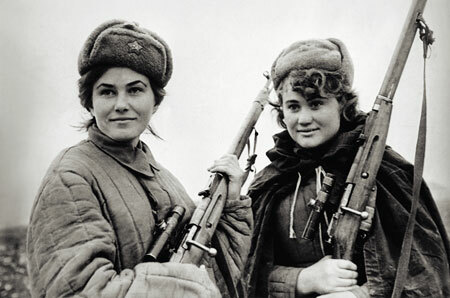 Not only did they employ accurized M1891 Mosin-Nagant rifles with fixed-power scopes, but they also used entire units of female snipers. The Eastern Front during World War II saw some of the most savage com-bat in human history. Amid this veritable sea of blood, much of the martial technology we take for granted today found its genesis. That both the Germans and the Soviets were so utterly morally corrupt casts an even darker pall across this sordid conflict. The Germans were fighting to starve out an entire population. The Soviets fought for survival at first and then ultimately for vengeance. Sepp Allerberger’s exploits offer some fascinating insights into the early art of modern battlefield sniping. Even today, countless lessons can be drawn from his experiences. I recommend Albrecht Wacker’s tome, Sniper on the Eastern Front: The Memoirs of Sepp Allerberger, to any serious student of the craft. Special thanks to www.worldwarsupply.com for the cool replica gear used in the execution of this project. Will Dabbs grew up in the Mississippi Delta and has a degree in Mechanical Engineering from the University of Mississippi. He is Airborne qualified and accumulated 1,100 hours flying UH-1H, OH-58A/C, CH-47D, and AH-1S heli-copters. He currently works in his own medical clinic and maintains a licensed 07/02 firearms manufacturing business building sound suppressors.